1. Be Flexible- The best way to save money on rooms and event space is to be flexible with your dates. Let the sales manager know up front that you have a certain budget to work with and that your dates are flexible. This can help the sales manager find low-demand dates that can give you the same meeting space and rooms for less! 2. Select A Location That Has On-Site Food & Beverage- Food costs can really drive your bill up fast. By finding a location that has on-site food and beverage, you will be able to negotiate costs better and they may be willing to create a smaller, more cost effective menu for your event. 3. Ask For Volunteers- Save on labor costs by asking for a few attendees to volunteer their time to man the registration table for a few hours during the conference. You can discount or give them free registration to cover the cost of their time and it will save you on labor costs. 4. Offer Sponsorship Opportunities- Depending on the type of event you are planning, you may be able to ask businesses to sponsor the event for a fee. This will offset your costs and help them gain new customers. It can be a win-win situation! 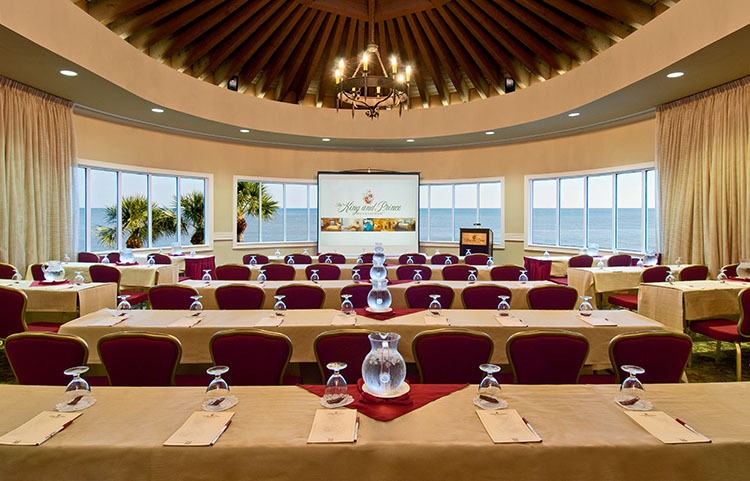 To learn more tips on meeting planning or to host your next meeting at our oceanfront resort, visit our website. Meeting and conference planners are always looking for ways to create a unique experience for their attendees. With many professionals attending multiple conferences a year, they can become bored with the “same old” experience time and time again. Here are our top three ways to wow attendees at your next meeting! 3. Spice up your banquet. The steak, chicken and veggie entrees can be eaten anywhere. Ask your catering manager if they can prepare a meal with locally inspired dishes. In the south that would mean shrimp & grits, fried green tomatoes, delicious BBQ, crab cakes, cat fish and mac & cheese. If your guests are traveling from out of town, they will enjoy the local cuisine instead of the same old standby foods! 2. Engage attendees in person as well as on social media. In today’s society, we cannot focus on just engaging with clients and attendees solely in person (although that is very important). Create a social media strategy to not only engage with your attendees but to encourage them to engage with each other throughout the conference! This will help them to enjoy their time at the conference and will also result in continued dialogue about the topics presented at the conference long after everyone has gone home. 1. Encourage attendees to get out and explore the local area. So many times meetings are scheduled so there is no “down time” for those attending the conference. Work with your meeting planner or local CVB to provide your guests with local activities that they may enjoy. This will translate into more productivity during the meetings and happier attendees! That sounds like a win-win to us! For more information about meetings or to plan a convention at our Georgia resort, visit our website. Presenting at a conference or meeting can be stressful. Here are some tips to help make your next meeting more productive and stress- free! Practice, practice, practice– There is nothing worse than an unprepared or unorganized presenter! Don’t let all of your time and energy be in vain. Practice what you are going to say before hand. Make sure you speak clearly, are able to get all of your points across and that you finish up in the time allotted to you. Keep it short– Make sure your presentation is no more than 20-30 minutes long. If you speak for longer than that, you run the risk of losing the group’s focus. If you have more to say, you can break your presentation into two sessions. Give them a small break in between to get up, stretch and grab something to drink. A well planned presentation should not last longer than 20-30 minutes. Incorporate multimedia– Change up the “usual” presentation. Add a short video that is relevant to what you are speaking about. YouTube has an endless supply of these. If you are using PowerPoint, add some photos! Encourage participation– Although this may not work for all meetings, sometimes it is good to ask for participation from the attendees. You could start off your presentation with a question and ask them to answer it. Or, at the end, you could ask if anyone has anything to add or any questions that you could answer. Recap your key points– Doing a recap of your key points or ideas is a good way to wrap up a presentation. It re-focuses the group and emphasizes your key points. It is a simple way to bring your presentation to a close while giving relevant information. Prior to the meeting, coordinate details with the audio visual team. To ensure that everyone on the production end of the meeting is on the same page, be sure to provide the audio visual engineer with the agenda, so he or she will understand the order of speakers and meeting flow. Help your speaker understand their audience. For example, their knowledge level regarding the topic, their seniority, demographics, etc. Review staging details. Does the speaker plan to walk around or remain seated? Whatever the case, make sure the speaker knows where the cameras are. If the speaker is presenting amongst a panel, make sure everyone knows the order and protocol to prevent any communication confusion. Moreover, if there are any technical limitations, make the speaker aware of such information (for example, a glitchy microphone or teleprompter). Have a backup plan. Technology issues, last minute cancellations or other unforeseen events can be surmounted if there is a solid backup plan in place. Be clear about the speaker’s time allotment. Use a countdown clock so the speaker will be cognizant of timing. As hybrid meetings continue to rise in popularity, be sure to allot enough time for the interactive elements of the presentation. Consider audience involvement and visuals during rehearsals. What happens after the speaker’s presentation? To help the speaker conclude with a smooth transition into the next segment of the meeting, remember to describe the closing sequence. Provide feedback. Talk to your audience and provide your speaker with feedback – this can only help to improve future sessions! Do you have any success tips or prep steps to a seamless presentation? Let us know in the comments! Meeting planners know all too well the importance of manning even the tiniest of details. Sometimes, it’s easier to rely on trusted relationships and what’s familiar by booking the same meeting venue year after year. But, finding a new venue can be easy if you ask all the right questions. When it comes to evaluating a new meeting venue or site to host an annual conference or corporate event, here’s how to test a good site from a basic one. 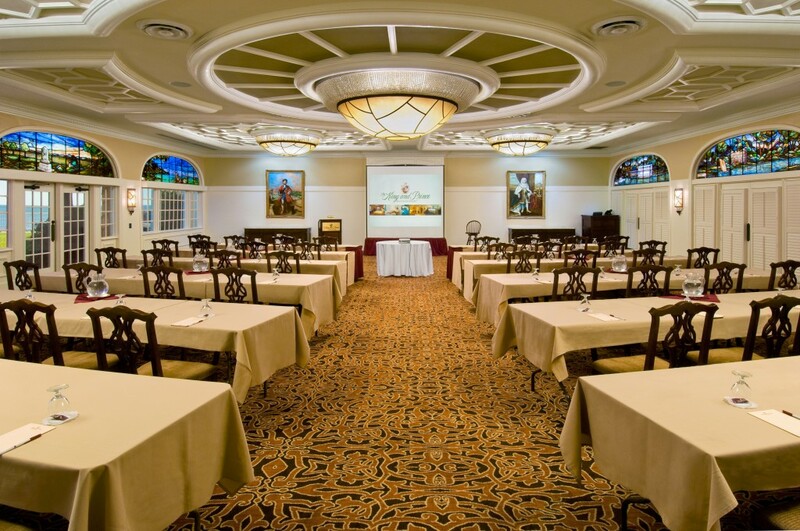 What are the meeting venue’s top qualities? Is it located in an urban environment, a unique environment, or in a centralized location? Does the conference center boast any amenities, such a spectacular view or some type of sporting activity? Is it close to a tourist attraction? Is the conference center known for anything in particular? Are there any activities that the hotel is famous for? Are there any area events that are going on around the same time as the planned event? Does the venue meet your technology specifications? Since many of today’s meetings involve multiple uses: email, social media, downloads and more, meeting planners are having to delve into speed, capacity and bandwidth issues. Free wireless connectivity is relevant only if it has the capacity to fulfill the technology specifications of your conference. Kristi Casey Sanders of Plan your Meetings recommends the Ookla Speedtest to test network performance. In Georgia, off of the Atlantic Ocean, St. Simons Island is an idyllic place for conferences and annual meetings. With its dependable temperatures, golf opportunities, historical roots and a slew of other outdoor activities and restaurants, the meeting venue favors plenty of things to do and see without making it too overwhelming for meeting planners to coordinate. On St. Simons Island, The King and Prince is proud of the award-winning meeting spaces available on the property. Plus, the assortment of accommodations appeals to attendants, who might have varying budgets and lodging requirements. While the location of a meeting venue influences its convenience, transportation and parking are just as important. In New York, conference attendants may find flying in town convenient but cab fares, and the cost of parking and other transportation inconveniences are not always the best place to host conferences. Consider cities where parking costs are economical. Also, consider meeting venues and hotels where parking costs are reasonably priced, making it convenient for meeting attendants. Don’t forget to evaluate the distance from the airport to the meeting venue. As with planning any conference or meeting, rates influence the budget. When reviewing pricing, ask for a comparison of the venue’s packages vs. à la carte rates. Refer to this example of a meeting planning package.